Everyone knows about the so-called Face on Mars, and in the same general area (Cydonia) of the Red Planet there are objects some have called pyramids on Mars. Better resolutions images demonstrate that there really was no monumental face on Mars, and the pyramidal structures are most likely caused by prevailing winds that erode the sides of mountains or some other directional eroding forces as seen on Earth (cf. Matterhorn). First off, from this one image you can’t even say it’s pyramidal in shape. The back side that is unseen could be rounded or otherwise out of the needed shape. We also don’t know about the shape of the rock under the sand. Lastly, with the shadow I can’t really tell that the dark side is flat or not. Even calling it a pyramid cannot be fully justified. Also, look at the scale here. It was captured not too far away from the Mars rover, and other rocks in the background and foreground give you an idea of how large the “pyramid” is. Mind you, the Rover itself at its highest is about seven feet above the ground, and the base of the rover is about two feet above. These are rocks that the rover could potentially drive over but will probably be avoided. But that hasn’t stopped the wild speculation. It’s being suggested as either some sort of land marker for directional purposes or the top of some much larger structure, the top of a pyramid. If it’s a marker, then it’s a bad design since it fails to be larger than the surrounding rocks and thus impossible to be distinguished by a traveler. And supposing there is some large pyramid underneath the soil is just groundless (*pun intended*) speculation. Still, what are the chances of finding such a rock of this size on Mars? Given the millions of such objects and the millions of ways a picture could be taken to given the appearances of pyramidal shapes, not to mention the pattern-seeking ways of the human mind, it seems like a pretty darn close to 100%. A pyramidal rock just isn’t that strange a thing to exist (eg., here). 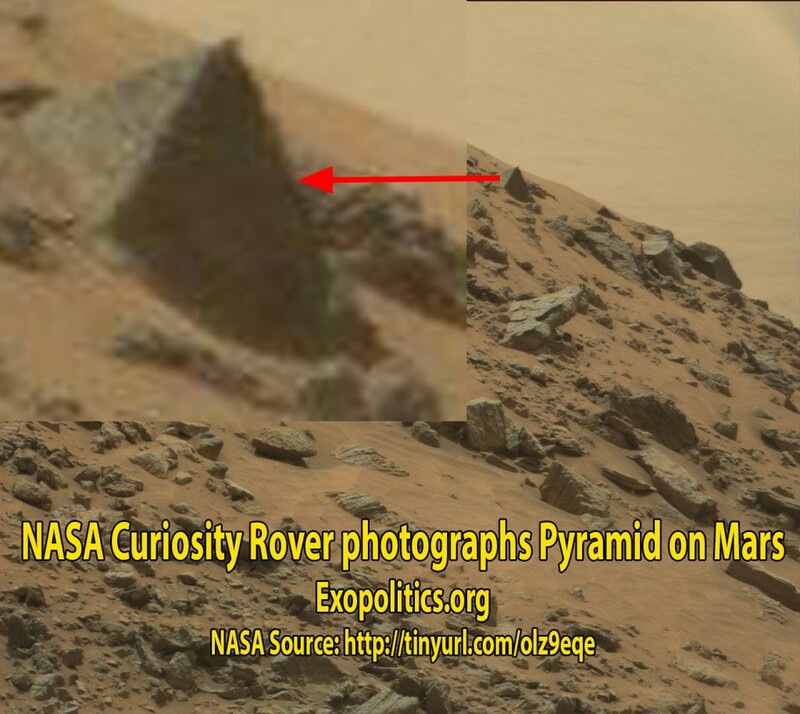 Heck, after a little bit of looking, and I see that a pyramidal rock was found on Mars by Curiosity back in 2012! But in this case, you can see it’s not smooth on all sides and almost certainly a natural formation (the person in that link saying it looks “melted” on one side really should take a look at lava). Looks like we have a combo of pareidolia and pyramidiocy. This entry was posted in Astronomy, Pseudoscience and tagged Astronomy, Pseudoscience by Aaron Adair (Gilgamesh). Bookmark the permalink.